For today's deals roundup, we have found pretty good deals on smartphones on Paytm Mall. The products we’ve listed down are from brands like Huawei, Samsung, Apple and more. If you’re on the lookout for some interesting deals on smartphones then you are at the right place. 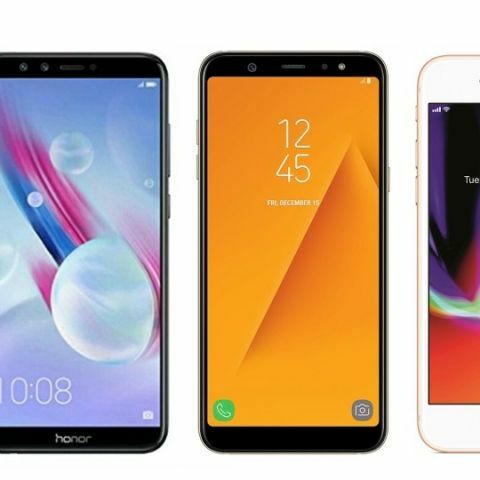 The products we have in this list are Honor 7X, Samsung A6, Moto G6, Apple iPhone 8 and more. The Honor 7X sports a 5.93-inch full HD display with a resolution of 1920 x 1080 pixels. The device is backed by a 2.36GHz Kirin 659 octa-core processor. The smartphone packs a 4GB RAM and 64GB internal memory. As far as the cameras are concerned, it has a 16MP + 2MP sensor at the back, while at the front, the smartphone is equipped with an 8MP unit. Click here to buy. The Samsung Galaxy A6 features a 1.6GHz Exynos 7870 octa-core processor, which is paired with 4GB RAM and 64GB internal memory. For the ones who look out for the camera in a smartphone first, it has a 16MP sensor at both the front and back. Click here to buy. The Moto G6 sports a 5.7-inch display, which is protected by Corning Gorilla Glass 3. The device runs on Android 8.0 Oreo with and is powered by a 1.8 GHz Qualcomm Snapdragon 450 octa-core processor. The smartphone packs a 4GB RAM and 64GB internal memory. About the cameras, it has a 5MP sensor on the front, while the back is equipped with a 16MP unit. Click here to buy. The Apple iPhone 8 is powered by the Apple A11 Bionic chipset. The device packs a 2GB RAM and 256GB internal memory. When it comes to the cameras, it has a 12MP unit at the back and a 7MP sensor on the front. Click here to buy. The Honor 9 Lite features a 6-inch full HD display with a resolution of 1080 x 1920 pixels. The smartphone is backed by a Kirin 659 octa-core processor, which is clocked at 2.6GHz. The cameras are the highlight of this smartphone. The device sports a 13MP dual-camera setup at the front and back. Click here to buy. We have already mentioned the Galaxy A6 earlier in the list. The Samsung Galaxy A6 Plus is the upgraded version of the same. The device comes with a 1.8 GHz Qualcomm Snapdragon 450 octa-core processor with 4GB RAM and 64GB internal memory. It has a 16MP + 5MP dual-lens at the back while the front is consists of a 24MP unit. Click here to buy. The Oppo F7 sports a 6.3-inch IPS display with a Corning Gorilla Glass 5. The device features a 2.0GHz MediaTek MT6771 Helio P60 octa-core processor, which is paired with 4GB RAM and 64GB internal memory. For the selfie lovers, it has a 25MP front-facing camera while at the back, the smartphone is equipped with a 16MP unit. Click here to buy.